Background: Evaluation of the cerebrospinal fluid (CSF) white blood cell (WBC) count and glucose and protein concentrations is used to assess the probability of the presence of central nervous system (CNS) infection. Although normal values are well established for CSF cell counts and protein and glucose contents in children and adults, this is not the case for neonates. 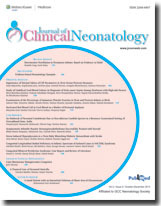 Aims: The purpose of this study was to evaluate the composition of noninfected CSF obtained by nontraumatic lumbar puncture in neonates (age<28 days), specifically distinguishing CSF profiles of those term babies compared with those premature infants. Materials and Methods: The CSF samples obtained by lumbar puncture from 120 neonates were examined by routine procedures. Results: By comparing CSF parameters between term gestation neonate group with premature neonate one, nontraumatic puncture, there was no statistically significant difference (P<0.05) in the mean WBC (P=0.6). The mean protein concentration was significantly greater in those premature neonates (P<0.04). The mean glucose concentration was also analogous in both groups (P=0.5). Conclusion: The CSF profile, like any other laboratory determination, should be evaluated within the clinical context of the individual case. Context: Blood culture is gold standard for diagnosis of neonatal sepsis. Low sensitivity of blood culture is usually due to small volume of blood sample, intrapartum antibiotics, and antibiotics given to newborn before sampling. Aim: We evaluated use of Umbilical cord blood culture (UCBC) in diagnosis of neonatal sepsis as compared to peripheral venous blood culture. Settings and Design: This study was done in tertiary care teaching hospital during May-June 2012. A total of 45 newborns with presence of two or more risk factors of sepsis were included. Subjects and Methods: Blood sample from placental end of umbilical cord was collected and cultured. Primary outcome was diagnosis of neonatal sepsis by use of umbilical cord blood sample as compared with venous blood sample. Secondary outcome was to compare organisms identified by UCBC and venous blood culture. Statistical Analysis: Sensitivity, specificity, positive and negative predictive values of UCBC were calculated. Results: A total of 24.44% (11 out of 45) high-risk newborns had positive UCBC. A total of 17.8% (8 out of 45) newborns had positive blood culture report. Organisms grown in UCBC were Pseudomonas (45%, 5 out of 11), Acinetobacter (27.27%, 3 out of 11), Escherichia coli (18.18%, 2 out of 11), and Klebsiella (9%, 1 out of 11). Conclusion: UCBC is a good method for diagnosis of neonatal sepsis among high-risk newborns as compared to venous blood culture with a sensitivity of 80% and specificity of 91.43%. Organisms grown are comparable to blood culture samples. 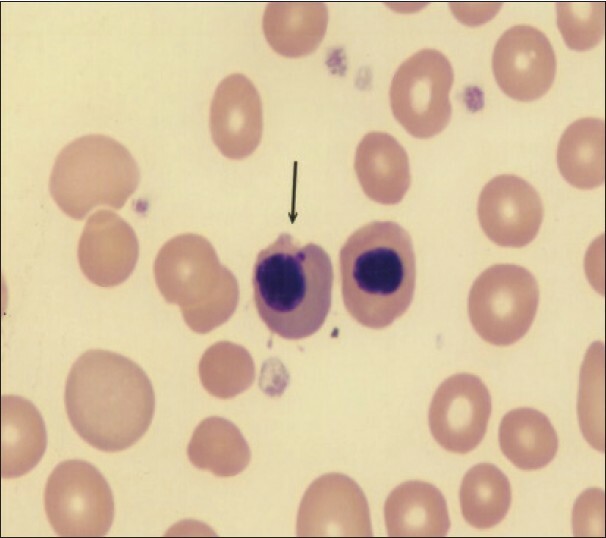 Background: Reticulated platelets (RPs) are newly synthesized platelets. Recently, an automatic method was established to detect RPs as a percentage of the immature platelet fraction (IPF%). Although, neonates often develop thrombocytopenia at some time during their hospitalization, the details of IPF% in neonates remain unclear. We, therefore, studied the relations between IPF% and other factors to gain a more detailed understanding of IPF% in neonates. Methods: The following clinical data were obtained from the medical records of 105 neonates who met our inclusion criteria: Gestational age, birth weight, IPF% and platelet count of neonatal peripheral blood at birth, and perinatal data. The subjects were divided into three groups: Group A, birth weight standard deviation score (SDS) ≥ −2 standard deviation (SD) and ≤ +2 SD; Group S, < −2 SD; and Group L, > +2 SD. Results: IPF% correlated negatively with platelet count at birth in the whole study population. IPF% was 2.8 ± 1.3% in term neonates, and IPF correlated negatively with gestational age and birth weight. 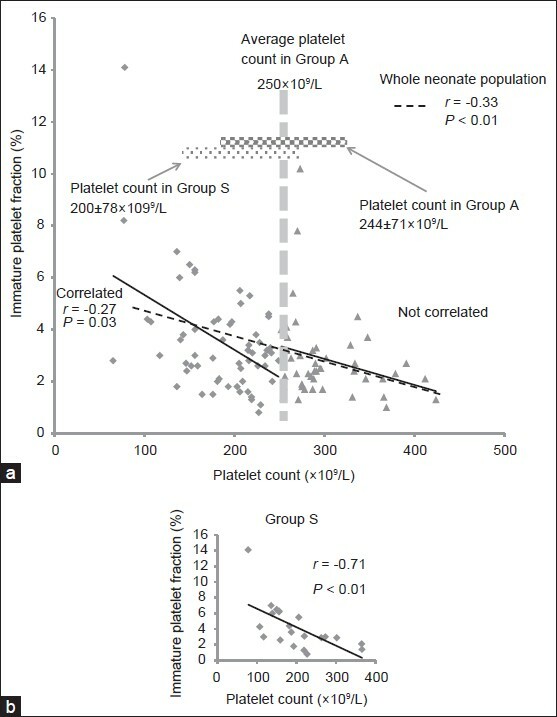 Platelet count correlated positively with birth weight SDS in the whole study population and in Group S. IPF% correlated negatively with birth weight SDS in the whole study population and in Group S. In neonates with a platelet count below 25 Χ 10 4 /μl, IPF% correlated negatively with platelet count. Among other neonates, however, IPF% remained almost constant. Conclusion: Monitoring of IPF% is useful for estimating the function of thrombocytopoiesis in neonates and preterm infants. Background: Perinatal asphyxia is a major cause of neurological morbidity and mortality in India. The purpose of this study was to investigate variations in nucleated red blood cell (NRBC) in blood associated with perinatal asphyxia and its relationship to both the severity and short term prognosis of asphyxia. Methods: A prospective (case-control) study was undertaken at Gandhi Medical College and Associated Hospitals. A total of 100 neonates were included in the study. Levels of NRBC/100 white blood cells (WBC) and absolute NRBC counts in cord blood were compared for 50 asphyxiated (case group) and 50 normal neonates (control group). These parameters were also related to the severity of asphyxia and clinical outcome. Results: The number of NRBC/100 WBC in the blood of 50 newborns each in the asphyxiated and in the control group were mean 29.5 ± 26.0, range 7-144 NRBCs/100 WBC and mean ± standard deviation 5.9 ± 2.6, range 3-14 NRBCs/100 WBC respectively ( P < 0.01). Using quartile deviation, staging of hypoxic ischemic encephalopathy (HIE) was done on basis of NRBC count and there was 80% agreement between clinical and NRBC staging of HIE. There was a significant ( P < 0.01) correlation of the number of NRBC\100 WBC with Apgar scoring, HIE staging and mortality. Conclusions: The NRBCs/100 WBCs can be used as a simple marker for the assessment of severity and early outcome of perinatal asphyxia. 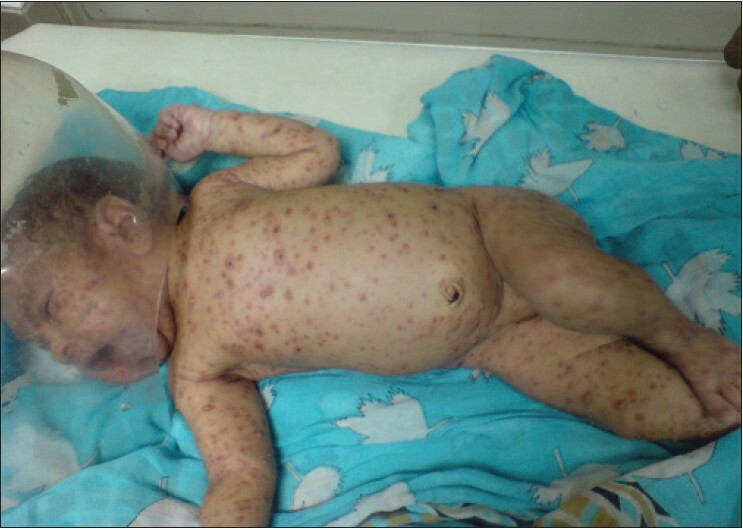 This case report describes the outbreak of candidemia caused by non-albicans Candida (NAC) species, which within a short period of 11 days, affected six neonates housed in the same room of neonatal intensive care unit of a rural tertiary care center in Uttarakhand state, India. The NAC species isolated showed complete resistance to azole compounds tested. All the neonates were having central venous catheters at the time of diagnosis, received total parenteral nutrition and were on broad spectrum antibiotics. Though two neonates survived the infection, but four of them had an unfortunate outcome and they died despite of aggressive therapy with amphotericin B. It was concluded that candidemia was associated with previously described risk factors and that poor infection control practices were likely responsible for outbreak. 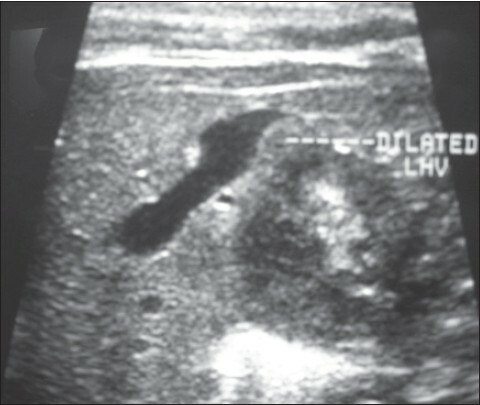 A case of hepatic hemangioendothelioma presenting as congestive cardiac failure in a neonate is being reported which was managed successfully with oral prednisolone, resulting in improvement of symptoms and regression of tumor within 3 months. Stress/sepsis induced transient hyperglycemia in the newborn may present with extremely high blood sugar values and may mimic neonatal diabetes mellitus. 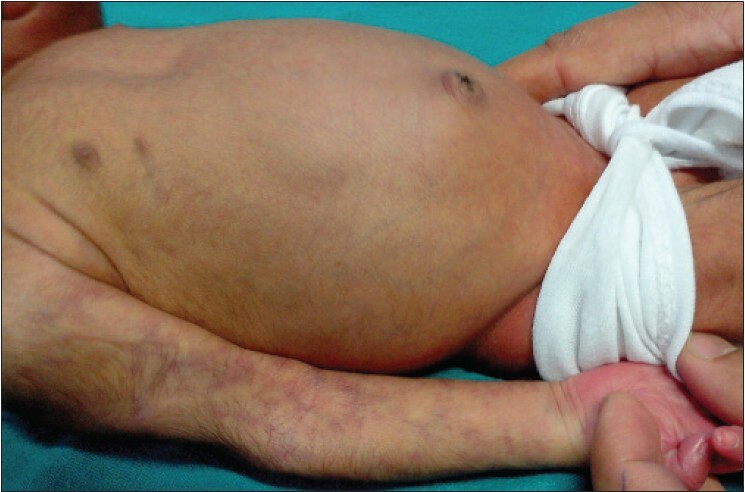 We present a case of neonatal septicemia with stress induced hyperglycemia mimicking neonatal diabetes mellitus. Extremely high blood sugar values upto 1529 mg/dl with metabolic acidosis were noted in a term good weight baby causing a diagnostic dilemma. It can be seen even in term babies, contrary to the belief that it occurs in preterm and small for gestation babies. Considering the prognostic implications it may cause it is important that hyperglycemia is promptly treated by insulin infusion. 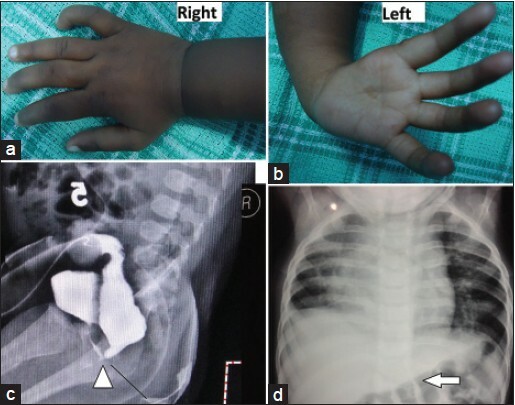 Congenital longitudinal radial deficiency is a rare congenital anomaly and encompasses a spectrum ranging from mild hypoplasia to complete absence of radius. Furthermore known as radial club hand or radial dysplasia, there is variable degree of deficiency along the radial side of the limb. The authors report a case series of four cases; two cases of isolated radial club hand and two associated with other anomalies, including VACTERL syndrome. The rarity of the disease and the need to exclude other associated anomalies are emphasized. 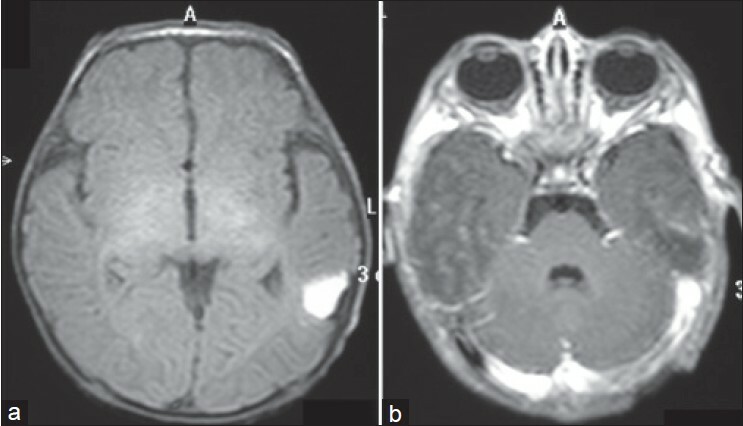 Congenital bilateral Perislyvian syndrome (CBPS) is a rare structural malformation of the brain in which the underlying anomaly is polymicrogyria. 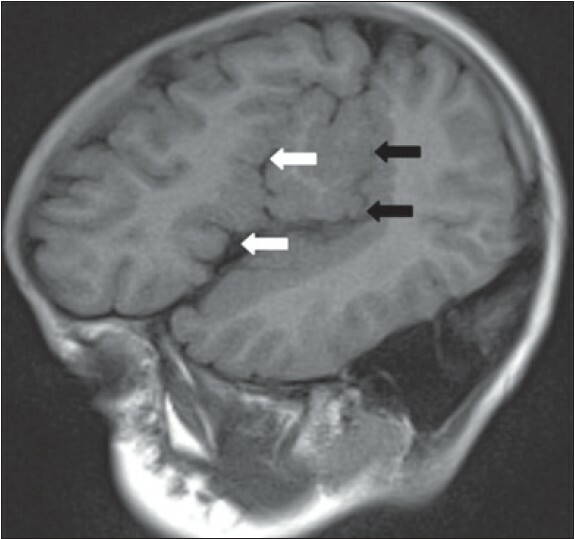 Polymicrogyria is a malformation of cortical development that is characterized by abnormal arrangement and excessive folding of cerebral cortical cell layers, often with fusion of the gyral surfaces, which can be focal or regional or involve the whole cortical mantle. Clinical manifestations depend upon the anatomical region of the brain involved. 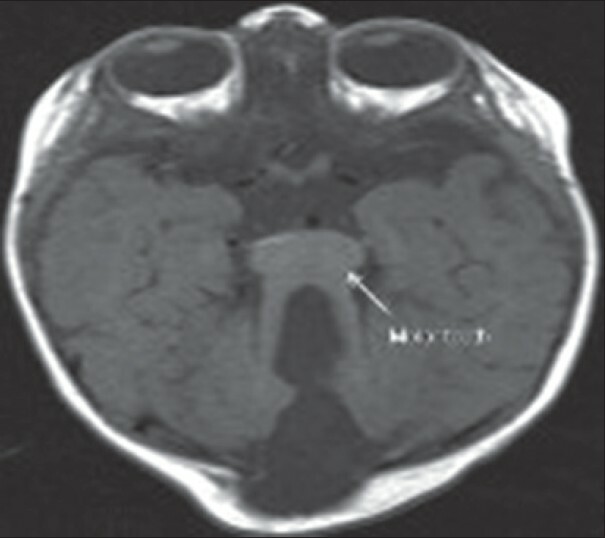 We report a case of 7-year-old male child with magnetic resonance imaging findings of CBPS.